For most popular grades of stainless steel. Established in the year 2010, we, 'Giriraj JI Enterprises', are an illustrious firms engaged in trading, wholesaling and distributing a commendable range of Welding Machines and Power Tools. The range offered by us encompasses MIG Welding Machines, Step Less Arc Welding Machines, Demolition Hammers, Power Rotary Hammers, Rotary Drills, Straight Grinders and Heavy Duty Cutters. These machines and tools are developed using quality tested raw material along with advanced technology at our vendors premises. To meet the diverse requirements of valuable customers, we offer our machines and tools in varied sizes and specifications at market-leading rates. Moreover, our esteemed clients can avail a qualitative range of Electrodes from us. 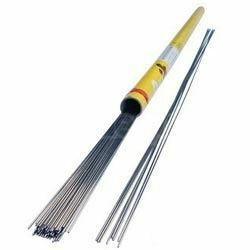 This range consists of Hard Facing, Stainless Steel, Hydrogen, Mild Steel and High Tensile Steel Electrodes. The offered products conform their adherence with the industry standards. The offered electrodes are appreciated in the market for their attributes like long service life and resistance against crack. Before the end delivery, all our products are stringently checked on varied parameters to ensure their flawlessness.